Pruning shrubs correctly requires some knowledge of the shrub you intend to prune, its growth and flowering habits, and the proper method of pruning. If you're considering pruning the shrubs in your yard, get to know them first. You may be surprised to find they need more or less pruning than you thought. People prune shrubs for a variety of reasons. Cutting away dead and diseased branches prevents diseases and insects from attacking the shrub. Dead segments on a shrub invite insect infestations, which can easily travel from the dead portion of the plant to the healthy portion. By pruning away the dead branches, you close the entry point for insects and prevent disease from taking root. Pruning shrubs also maintains their shape. While you can let a shrub grow in whichever way it wants to, a little pruning maintains a pleasant shape and can encourage the shrub to grow in spots where it's bare. Shrubs may also be pruned to keep them at a manageable height and prevent them from blocking windows or other access points to the home. Pruning shrubs generally falls into one or more of the following categories. Pinching: Pinching involves pruning the end of a long branch. This encourages the branch to send out side shoots and fill in rather than grow long and lanky. Thinning: Thinning means to take out dead branches and branches in certain areas of the shrub to open it up. Light more easily penetrates to the interior branches once the shrub is thinned. Renewal or Rejuvenation: Renewal or rejuvenation pruning means to cut a shrub back to encourage new growth. 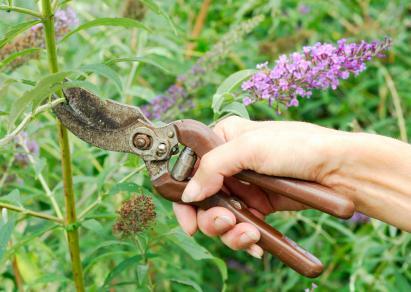 Many shrubs such as Buddleia (butterfly bush) benefit from renewal pruning. It keeps the plant to a more manageable size and encourages healthy growth each year. Shaping: Many shrubs are pruned to shape them into more desirable and pleasing forms. A topiary is one example of shaping, but even bushes such as boxwood and azalea are shaped to form dense hedges, rounded forms and other shapes that fit into the landscape. Shearing: If you've ever taken hedge clippers to a thick yew or hemlock hedge, you've used the shearing method of pruning shrubs. It means to cut off large sections, such as the techniques used to square off hedges. It's critical to prune shrubs at the right time of year. This varies widely, with some shrubs requiring pruning immediately after blooming and others preferring a prune in the early spring to put forth more buds. Know your landscape shrubs; take a cutting to your local garden center or County Cooperative Extension office for identification if you're not sure what shrub you're looking at. Then, when you know the type of shrub you're dealing with, look up the proper pruning time of year. The right tools make pruning shrubs easier. Use very sharp hand pruners for most jobs such as thinning, shaping and pinching. Lopping shears have long handles and sharp blades and are good for thick shrub stems and tall plants. An electric hedge clipper makes shearing easier, but be careful not to shear off the cord! It's happened to every gardener at one time or another. You're happily snipping away and suddenly realize you've cut way down into the plant, or you've lopped off more than you thought. If your plant looks lopsided, trim it so it evens off. If you've cut too much off, just stop and back away. Nature is resilient and with luck, the plant will make a full recovery. Pruning shrubs often leads to mistakes, but with a bit of time, nature corrects them. If you're snipping away dead or diseased branches, before using the pruners on a healthy plant, dip them in a bleach and water solution. Bleach kills microbes and prevents diseases from spreading from one plant to another. It's also a good idea to rinse tools after use, dry them, and store them properly. Yearly maintenance on hand tools such as replacing blades or sharpening blades makes pruning easier on both your hands and the plant; it will be much easier to snip through the branches, and you'll make sharper cuts which are better for the plant. For more information on pruning shrubs, visit your local county Cooperative Extension Office.